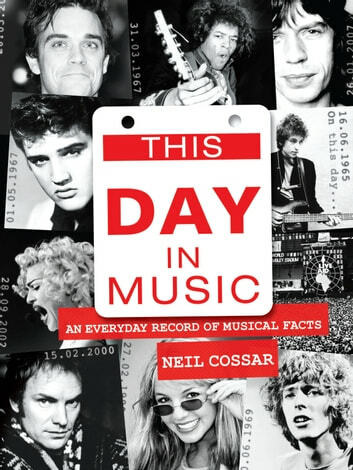 This Day In Music is the long-awaited book by Neil Cossar; a music diary presenting every day in the year listing the momentous musical events that have taken place on that day worldwide in the last 50 years. From Elvis to Lady GaGa, from rock and roll to rap, the book includes births, deaths, festivals, marriages, arrests, drug busts, famous gigs, awards ceremonies, number one singles and random musical trivia about musicians that bent the rules and much more. Fully illustrated throughout with pictures, press cuttings, album covers and ticket stubs, This Day in Music is a must-have book for any discerning music fan. Documenting key moments in music history, it also contains a chapter of ‘did you know?’ music trivia facts such the first record bought by musicians (Julian Casablancas from The Strokes bought ‘Faith’ by George Michael), artists real names (Marilyn Manson’s real name is Brian), worst jobs (Mark Stoermer, bass guitarist with The Killers, once worked as an organ/blood/body part delivery boy), first gigs and other entertaining random facts. This Day In Music brings together all the significant events in the history of rock and pop music in one giant diary. This Day In Music gives the facts, the figures, the dates, the times and the places, and most of all the stars, that made rock and pop the most vibrant art form of the 20th and 21st centuries. From Elvis to Lady GaGa, from rock and roll to rap, from 6.5 Special to X Factor, from Abba to ZZ Top and from New Year’s Day to New Year’s Eve, here is all the information you need to know, set out chronologically so you can look up those dates that interest you or simply pore through the year, month by month, day by day. Former musician Neil Cossar a was the guitarist in the late 70’s - 80’s group The Cheaters, (who signed to Parlophone Records, but never troubled the charts). Continually gigging throughout 1982, they were awarded ‘Hardest working band of the year’ by BBC Radio 1 after playing 321 gigs and recording an album! During the 90’s Neil worked as a radio DJ in Manchester, England presenting a late night show which featured countless ‘new acts’ in session including Radiohead, Blur, The Charlatans, Lenny Kravitz, PJ Harvey, The Cranberries and Tori Amos. This Day in Music was first published in book form in 2005 and is now available in this vastly improved and expanded edition.